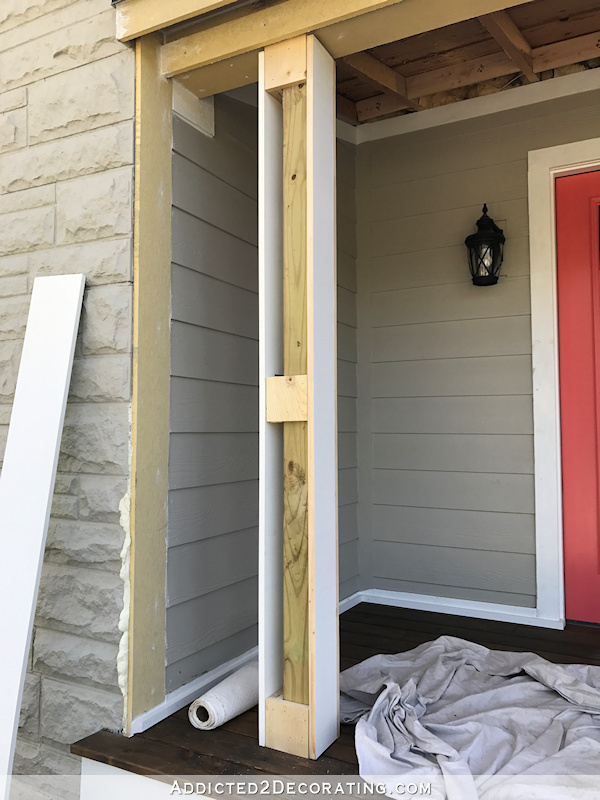 After working on my porch floor for several very long days without a break (if you missed it, you can click here to see my porch floor project where I built a wood porch over an existing concrete porch), Matt insisted that I take a day off to recuperate. I definitely needed it, but at the same time, I was chomping at the bit all day Tuesday to go out and wrap the front porch posts. So yesterday, there was no stopping me. 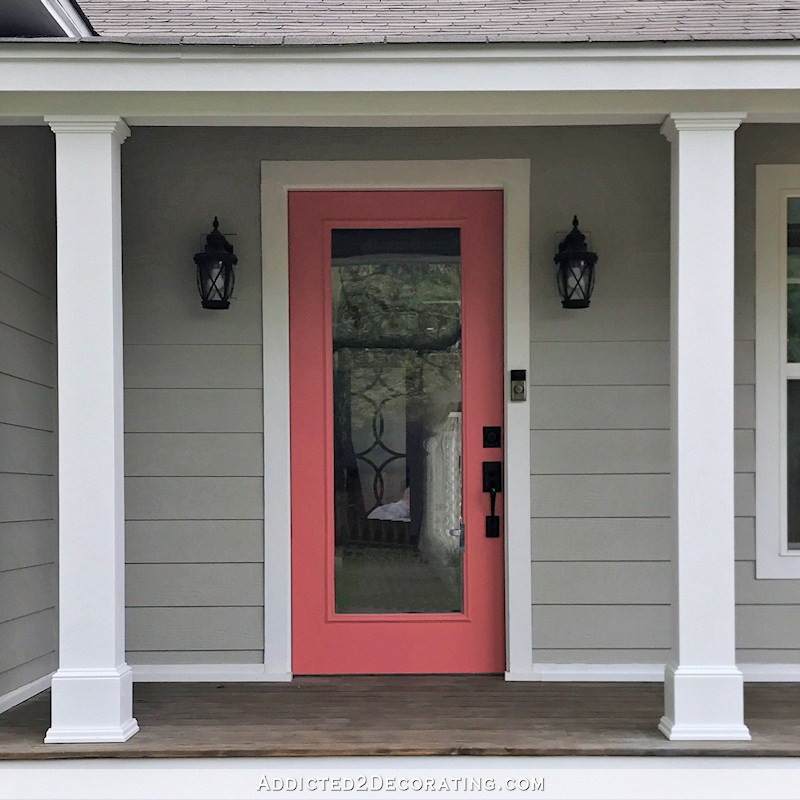 I’ve been so anxious to do this project for a very long time, and my one singular goal yesterday was to get as far as I could with turning those skimpy, plain 4″ x 4″ front porch posts into pretty, decorative columns with a traditional style. So after working until it was too dark to work anymore last night, this is what I had accomplished. I ended up going with the simple design rather than the tiered design that I really wanted. And since I only have three columns on the whole porch, and I decided to forgo the balustrade and the tiered column design, I made these columns a bit thicker and chunkier than I had originally planned. I really like the more substantial look. I’m still undecided about how I want to trim out the tops of the columns. I have a couple of ideas rolling around in my head, so hopefully I can make a final decision and get it done today. 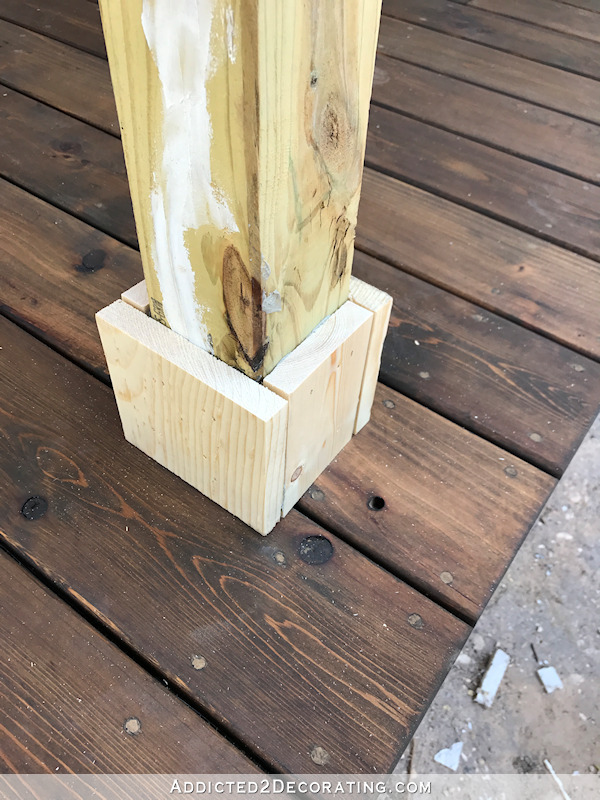 The first step was to add spacers around the posts. 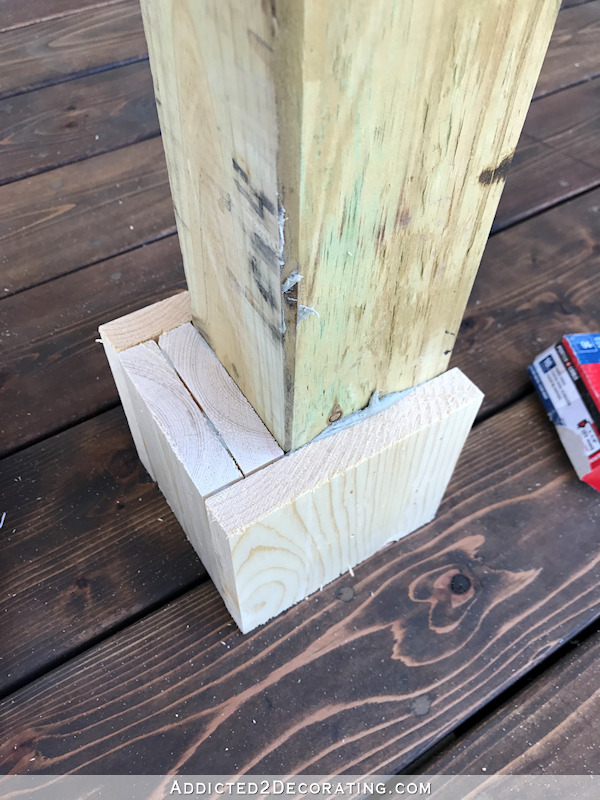 I started by cutting six 5-inch-long pieces of 1″ x 4″ lumber for each post, and attaching one piece to either side of the post using exterior construction adhesive and 16-gauge 2-inch nails. And then I cut six more pieces to go on the front and back of the post. These had to be ripped down to the correct width using my table saw. I repeated that on the middle of the post and the top of the post (which is why I needed six pieces of each size). 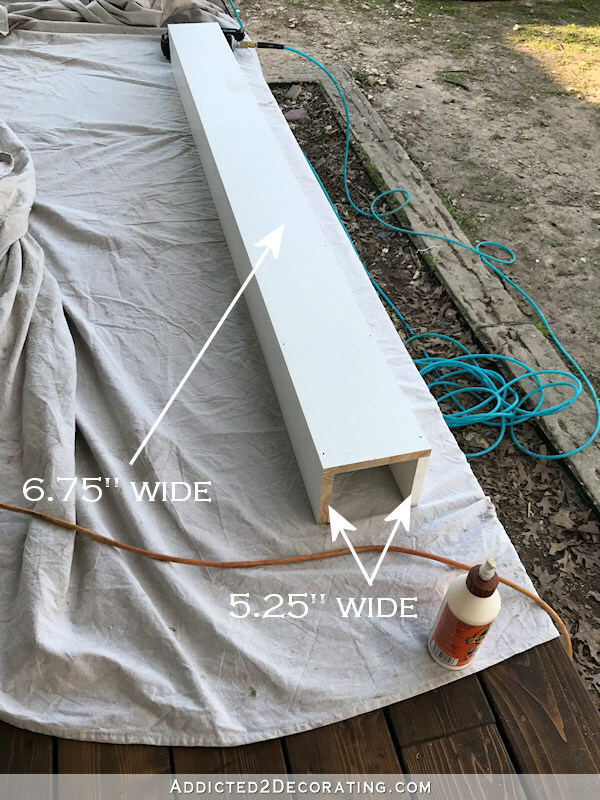 Next, I used my table saw to rip some pre-primed lumber to the correct widths to make a box around the posts and spacers. For each box, I used two pieces that were ripped to 6.75 inches wide, and two pieces that were ripped to 5.25 inches wide. I put three of the pieces together (the two narrow ones and one wide one) using wood glue and 1.5-inch 16-gauge nails. After letting the glue dry for a few minutes. 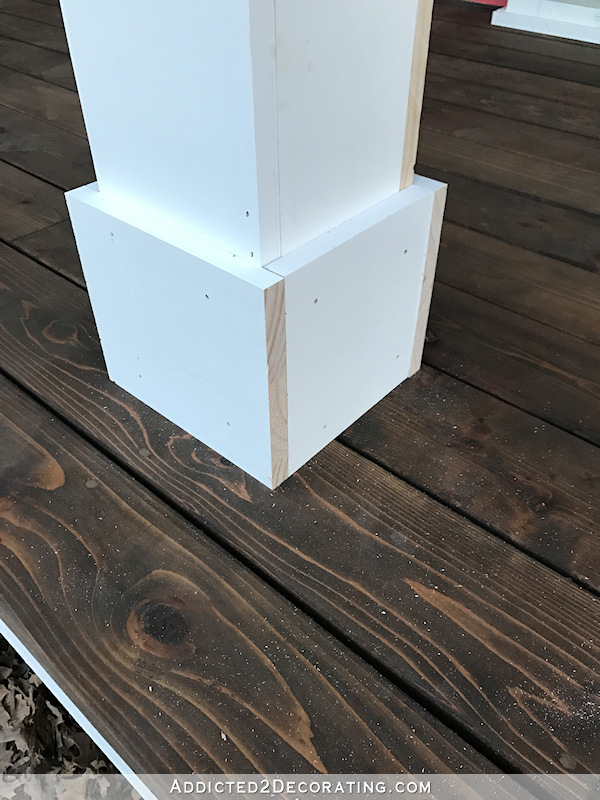 I placed the 3-sided box around the post and spacers. And then I attached the fourth piece (the second wide piece) in the same way. That gave me the basic column, but of course, I wanted to dress it up a bit. I started by cutting pieces of 1″ x 8″ pre-primed lumber to fit around the base. I didn’t miter the corners because my miter saw does a terrible job at mitering any lumber wider than a 1 x 5. But with wood filler, sanding, and caulk, this will look just as good. 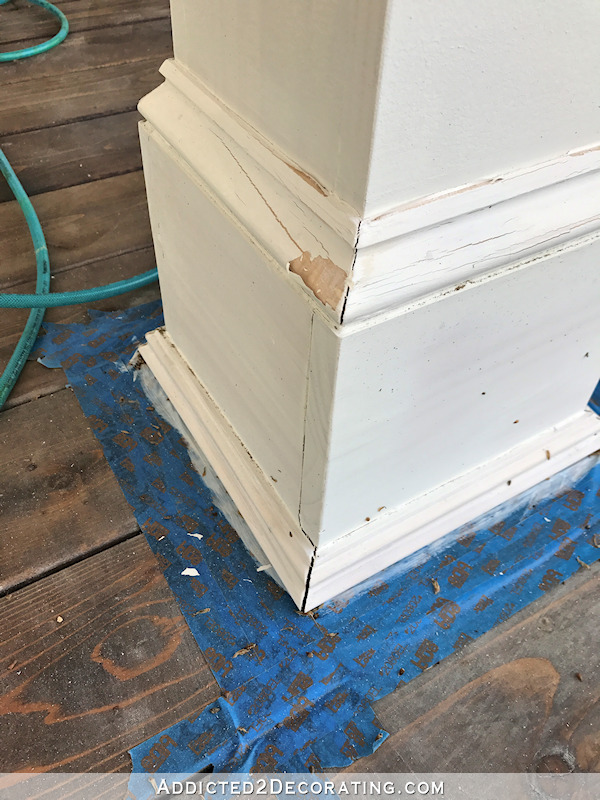 And then I used two of my favorite decorative moldings — panel molding and base cap molding — to finish trimming out the base. Since the panel molding is raw wood and it’s sitting at the base, I pre-primed the bottom and back side with oil-based primer before attaching it. The front and top edge will be primed before I paint the column. And that’s the progress so far! The columns are finished! Click the links below to see the rest of the posts for this project. 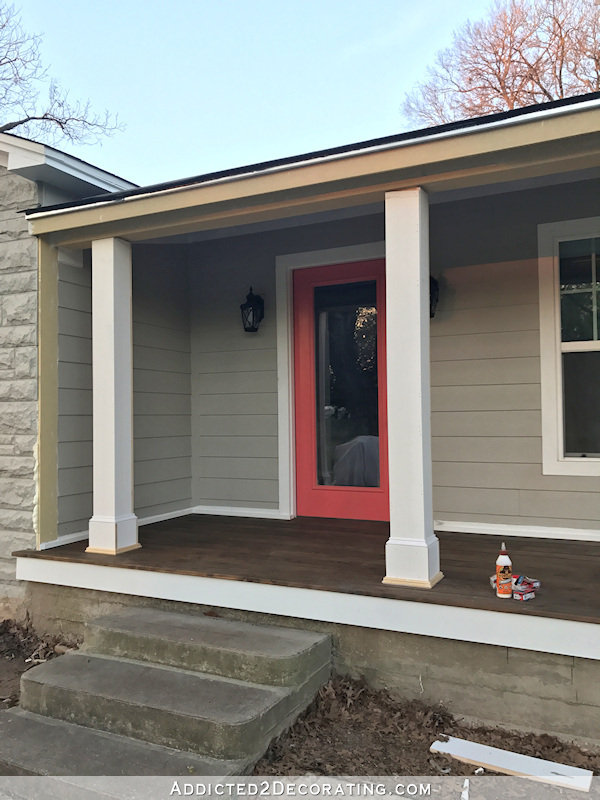 Next Post Porch Skirting Options - Paint, Lattice or Stone? I often find myself at a loss for describing how amazed I am about the skill of this AMAZING woman, but I think this word comes close as any word can…..WOWEE! A compliment any wife would be extremely pleased to hear from her husband! And you are right, her skills and determination are quite impressive! I agree!! She continues to amaze me! I can’t tell you how much I enjoy Kristi’s blog! @Matt – My sentiments exactly. She amazes & inspires me with every post. Totally awesome job. Totally talented wife. Take care of each other. She IS amazing, Matt! There are some really good blogs out there in blogland, but to me Kristi’s is by far the best of them all. A complete standout above the rest. The range and breadth of projects she does and work she takes on never ceases to astound me. Her talents and skills are practically limitless. I’ll never get over how much energy she has — she has the strength, vitality, and ideas of at least 10 individual humans all crammed into her tiny little frame! I agree with everything you said. She is amazing! Everything you do is beautiful-you never cease to amaze me! WOWEE is right! This looks sooo good! And good for you, Matt, for making her take some time to recuperate – she just goes full bore with such wonderful ideas, doesn’t she? Love it! Thanks, Matt, for making Kristi take a break! You rock! What a transformation! Kristi this is great. Looks awesome, you are doing a great job! The column design looks fantastic and I love how you adjusted the column by the front door. I’m always so happy when I see you have a new post. You do amazing work! BTW Matt, so nice of you to ask her to take a rest!! Looks great! I like the columns without trimming at the top. It’s hard to tell if there’s enough room at the top for trim without the trim sticking out in front of the header board (or whatever the top board under the roof is called). As I read your post today – I instantly thought…’your neighbors must love you!” It’s hard to believe all you’ve done to take a run down looking home and make it beautiful. Of course, we all appreciate the inside work you’ve done – but most people will never see the inside. It will be a pleasure to drive down your road and something your neighbors will greatly appreciate! I second this statement! Goodness knows I’d love to have her as a neighbor — she’s improved the look of the house immensely, and has made the neighborhood more beautiful with her work. I thought the same. Hopefully this will inspire the neighbors to keep up with the Linauers! The only problem if she was my neighbor, I would be comparing my house to hers and feeling terribly inadequate! I’m loving the transfaormation! So many porch posts are too narrow in proportion to the house. Well done! Looks so good. Glad you went more simple. I totally get the frustration of wanting one design but another just works better. When I get something in my mind like that I obsess and it’s hard to shift gears. Bravo to you. 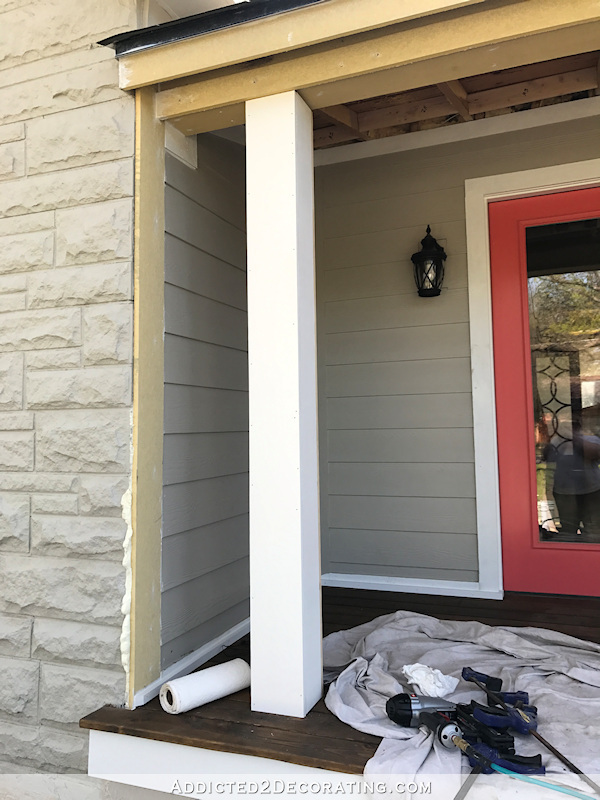 When the porch columns are finished can we get a before/after picture of the whole house so we can see how amazing it is from the street please? Absolutely! I tried to take one this morning, but I have so much stuff in the way — two tables with all of my tools, my truck parked in the front yard with for easy access to the lumber in the back of the truck, etc. hopefully I can get the columns finished and get all of my tools and supplies cleaned up by the end of the day so I can get some full view pics. 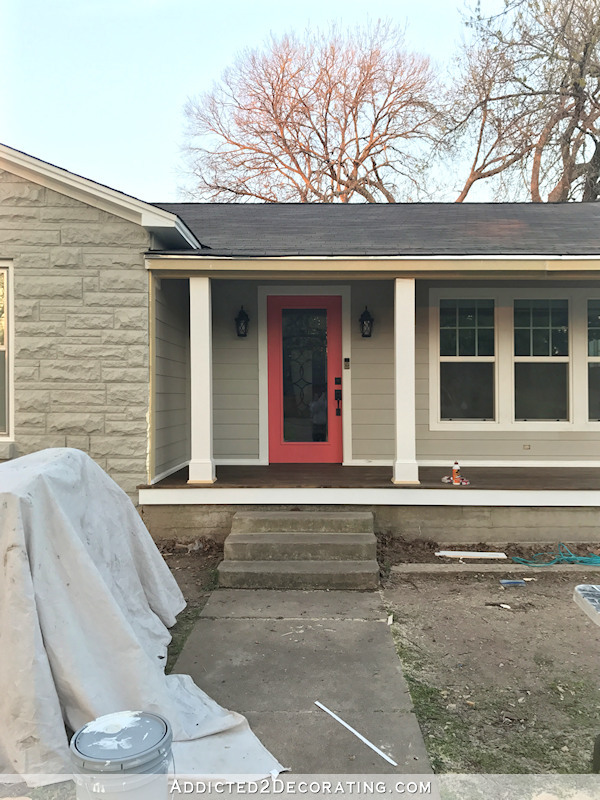 The porch is really looking great! I can’t wait for you to finish it up and work on the yard. I’m so impatient. I don’t know how you deal with the waiting. LOL! Do your neighbors come over and talk to you about all your hard work and how pretty your home is!?! If I was your neighbor, I would have my lawn chair and coffee out there….watching every move you make….just like a live tv show!!! haha, Darlene, I posted a similar question along with yours… It must be fabulous to living next to Kristi and being able to watch her work!! I bet they all love talking to you and each other about all this amazing stuff! It’s looking great already and you haven’t even finished them yet! I love that you decided to have the chunky bit only at the bottom and not much further up as I think that this suits your house font perfectly! I keep imagining your neighbours coming round while you are working on outside projects and questioning you about them – such as how you manage all that, where your inspiration comes from – and admiring what you do. is that happening irl as well or only in my head??? Wow….beautiful as always. What kind of feedback to you get from your neighbors? WOW!! Now I have to print this too to follow directions. You are amazing! I was thinking about this too. Because on her night photo of the third column you can get a glimpse of the inside and it looks gorgeous. It looks like a new house. 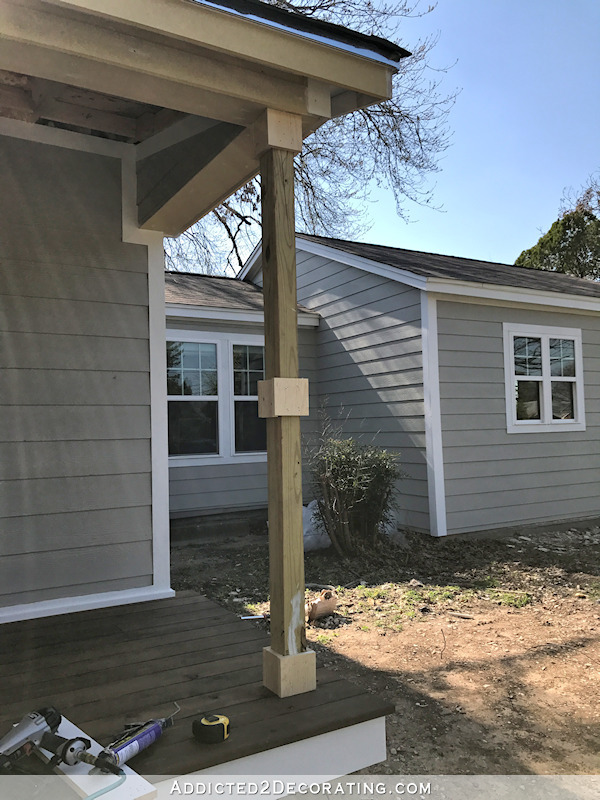 The porch project really made the difference! Beautiful, Kristi. Can’t wait to see how you dress up the accessories on the outside (plants, etc). Looking so good and I love how you thought to add all the bulk of the columns around the front door to the left to center things better. Brilliant! Very pretty. I love the added detail on the bottom. I am anxious to see a shot of the entire front of your home when you are ready! The columns look great! I would have neve thought of placing the spacers on one side or the other to gain a little distance. Very nice. Agreed. This was a brilliant idea Kristi, to even out the spacing of the columns in relation to the door with those spacers. 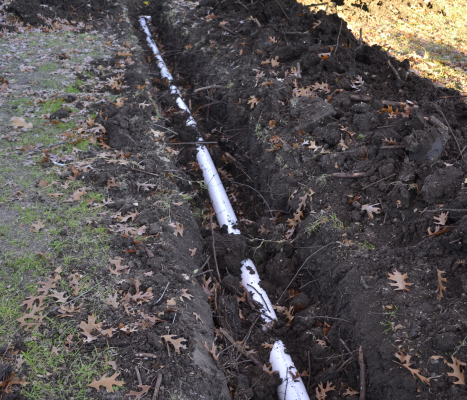 If it were me doing this project, I’d have finished the job and at the end gone “well, that doesn’t look very good!” LOL! Brilliant thinking ahead like that! Love this! I have a much smaller front porch but have told my husband multiple times I would like it to be wood floor instead of concrete. Also, would it be possible to do austin stone under the porch? You do amazing work and I love how they look with your porch floor. Can’t wait to see the whole porch complete. Wow…….I always seem to start with the word, wow, but that’s exactly how I feel when I see the work you accomplish Kristi. 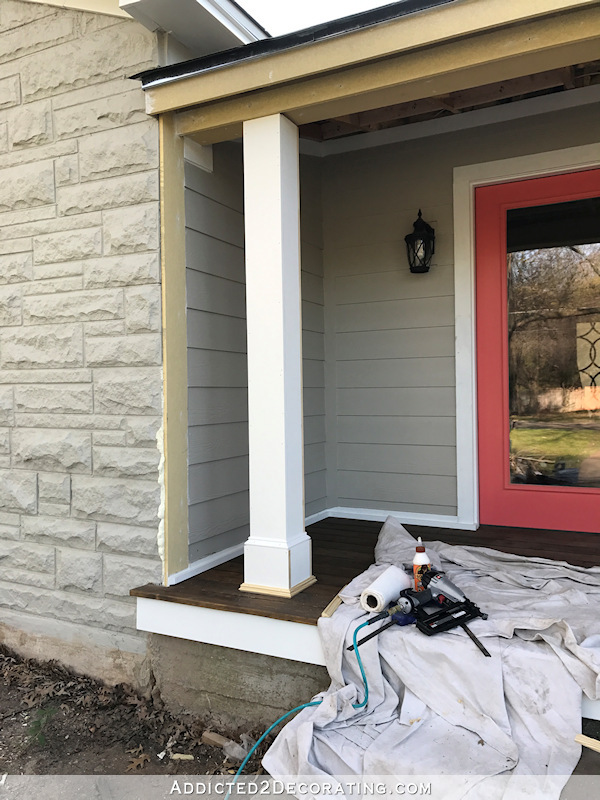 The columns are already looking fantastic and what a difference it’s already making to your porch and your curb appeal. Can’t wait to see the final reveal. Awesome job Kristi, you never cease to ‘wow’ us with how you do things. You are just so darn smart! What love you are giving that house! And you are getting so much done before it gets beastly hot there! The posts are looking terrific, Kristi! I do like the beefier look. However, it seems to me that something simple, like just the panel molding around the top, would finish off the post without “cutting it down” in appearance. However, I have learned that you have a great eye and am looking forward to seeing how you finish them off. Onward and Upward! Looks fabulous! I love how detailed your posts are. So helpful! And lots of pictures really helps too. Kristi, you nailed it, no pun intended! Krosti, can I interview somebody who could recount how early in your life this innate creativity showed up–this eye you have for all this? This isn’t just book-learnin’. I think it must be quite a story. Your house is coming along great. I am looking forward to the studio most of all. I love work spaces. I agree with Sheila Green. Do the top the same as the bottom, except make the top trim less than an inch shorter than the bottom. I bet your neighbors love what you have done!!! Wowee is the word! I have just joined your blog as a follower. You do beautiful work. Very impressed with your clever solution to “move” the door to be centered between the posts. You are an inspiration! Great job you just gave me the momentum to finish the bottom of my posts. Great job! Love them! Thank you for the detailed instructions and pictures. When I get ready to do mine, I will be using your tutorial. Can’t wait to see Part 2.
ooooooo! Your hoooouuuusssseeee! All the hearts! It’s just great. What an improvement. I would never had the vision to see what could be done with that porch. The cedar does look so rich and warm. And the pillars are lookin fantastic. It seems like you’re motivated again. I’m excited to see what you post on Monday. Wowee is right! I love how Matt is your biggest champion, he must be so very proud of you! 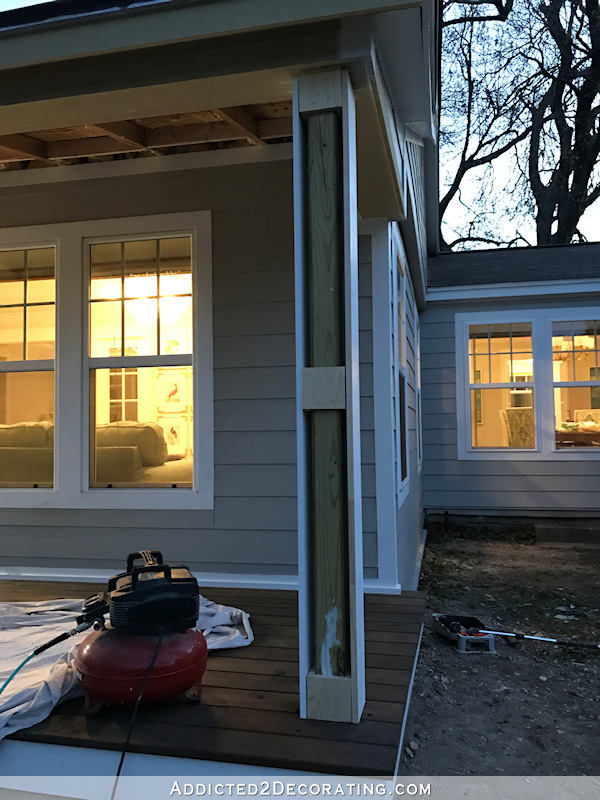 The porch looks fantastic and those columns…such a great choice! 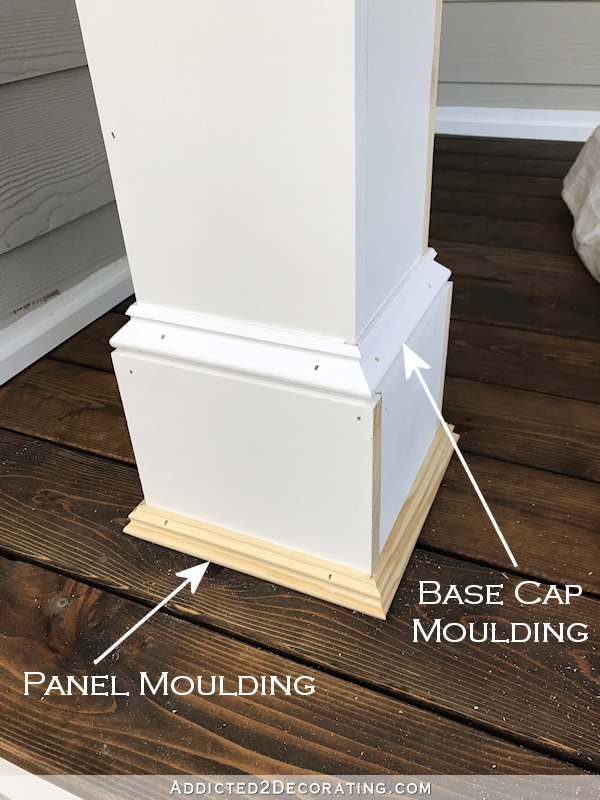 My question is how do you know or figure out high to make your base trim pieces? My hubby says you must draw it out on the computer first or at least on paper. Please share your method. Wow! What a transformation. This is truly amazing! You’ve done such a great tutorial here. I know it takes effort and time to take pictures while you go, and explain what you’re done, but it is greatly appreciated. This outdoor space is really amazing! I absolutely love this! Stunning! I can’t wait to see the before and after when you have it complete. 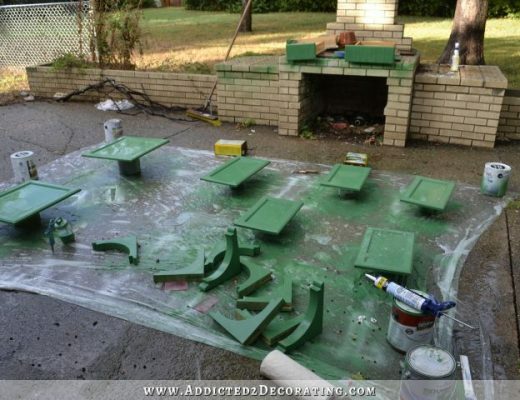 This is an amazing transformation already! I can’t wait to see how it looks finished and I’m sure, soon with new landscaping. 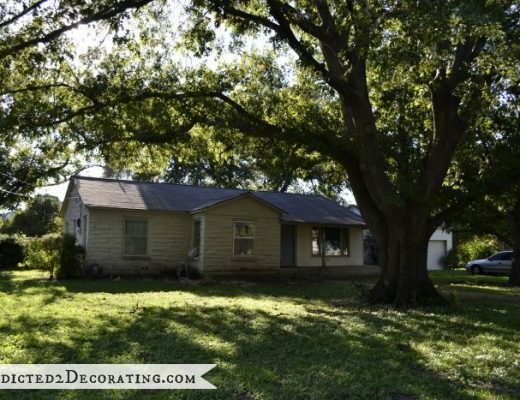 The exterior transformation is awesome! Looks awesome! 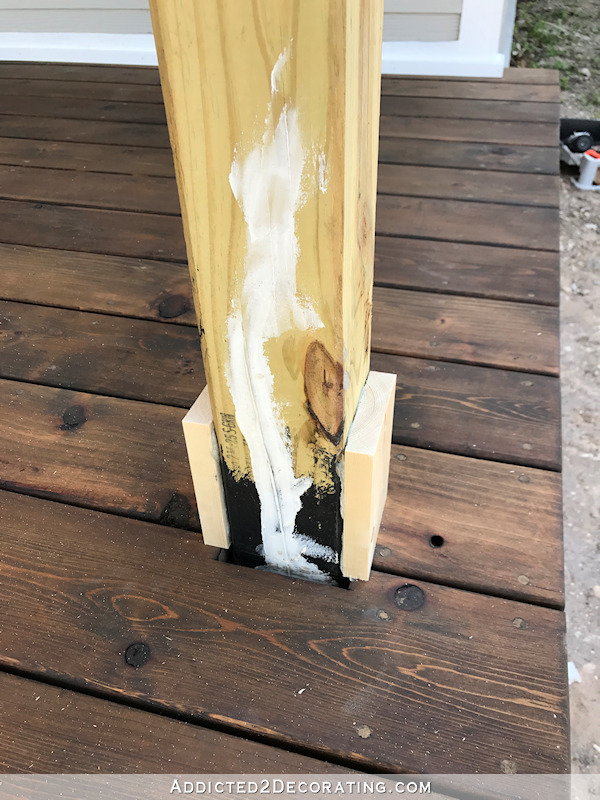 Also, I’ve been waiting for you to do this because we will be redoing our porch posts this Summer and I wanted to see how you did it. Now I just need to show the husband so that he gets an idea of what our steps will be. Just Brilliant! 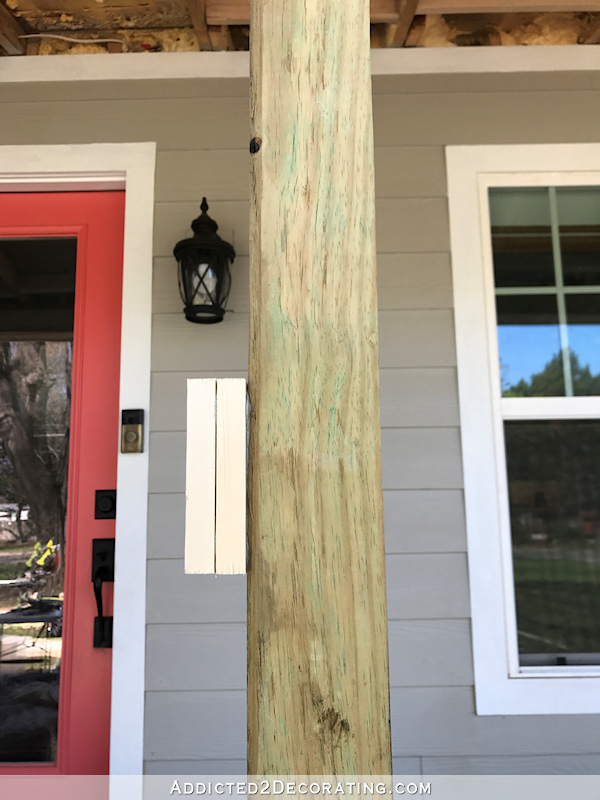 I don’t think I could have imagined adjusting the setting of the posts would make such a dramatic difference to the visual balance at the front of the house. The way you think through your options and decide on a plan of action is incredible. For what it’s worth, I think the upper trim of the posts should be kept as small scale as possible in order to not present a “shortened” appearance to the posts (if that makes any sense). You did an excellent job centering the front door between those two posts. And I agree with not mitering the bottom trim. It will look great. You are such an inspiration, Kristi, and I love how your mind thinks through a problem and comes up with a solution. 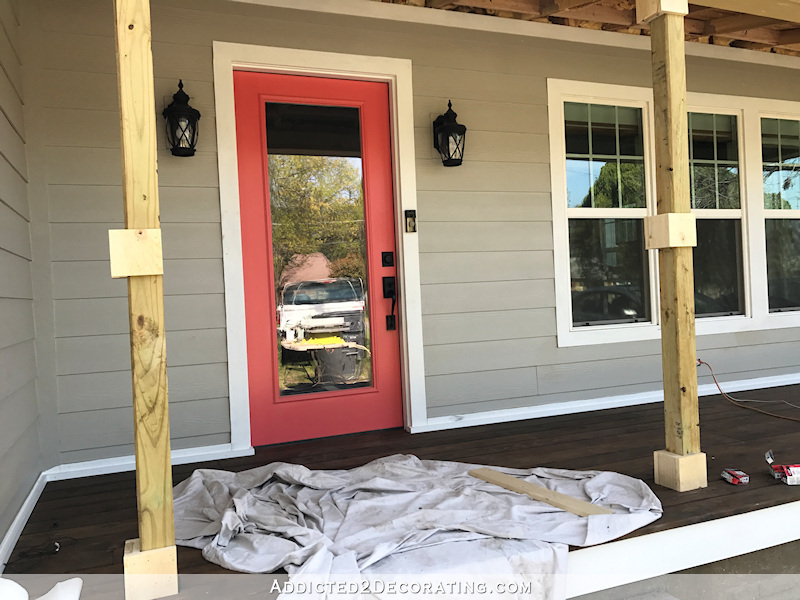 We’re going to do this to our two posts this summer and build cedar shutters, too, and your blog post will be the one we use, so thanks!! I love how Matt has your back, looking out for you.